£7,500 contents cover included (when building affected at the same time). For self-managed and agency-managed properties. Cover for loss of rent if house uninhabitable (terms apply). Your let property is an important part of your finances, so you need to know it’s insured with a trusted provider. We’re here to help. Whether you’re a buy-to-let landlord or an accidental landlord, we can offer a competitive quote online. Buy-to-let insurance covers risks that aren't included in regular home insurance, including voids between tenants. Buildings insurance covers your property against losses from risks like fire, storm and flood. Contents insurance covers your household goods within the property, as well as non-permanent fittings such as curtains. A standard home insurance policy is unlikely to be able to cover you adequately as there are a higher number of risks associated with your property. Landlord insurance is designed to take situations involving tenants into account. I own several properties. Can I insure them all at once? We’re pleased to be able to offer cover to all residential landlords. Our policies are based on the particularities of the individual property as well as your details, and for that reason we do not provide blanket coverage. As no two buildings are the same, customers should take out a separate policy for each letting, one which has been specified to meet the needs of the property. We also cannot insure commercial landlords. I’m a live-in landlord. Do I need insurance for lodgers? Letting rooms in your home without informing your insurer could invalidate your policy. This means that any claim you make may be rejected. You should therefore take out insurance for homeowners with lodgers so that your lodger is factored into your cover. The cost of a landlord’s insurance policy varies depending on the size, location and type of your property. The cost also varies depending on how much cover you take out, whether you opt to pay a little more to reduce your excess and whether you opt for any of the additional landlord cover options such as loss of rent cover or landlords legal expenses cover. Easy to deal with and competitive insurance; great! Use HomeProtect for home and landlord insurance, no issues with either. If a tenant can’t live in the let property due to an insured loss, we will pay for the loss of rent you would have received up to a maximum of £30,000 per claim. 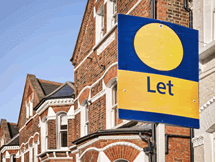 Interested in a quick landlord insurance quote online?